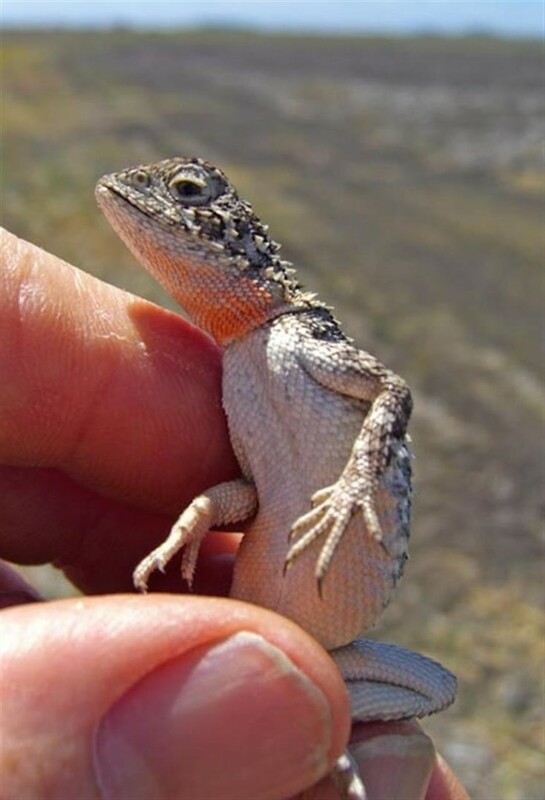 It’s taken a while, but a tiny endangered Darling Downs reptile has finally been given a scientific name. The newly-named Condamine Earless Dragon (Tympanocryptis condaminensis). Earless dragons are found throughout most of mainland Australia. They live in dry open areas such as featureless stony deserts, cracking clay plains and grasslands. Most extend across vast tracts of the interior, but one southern temperate grassland species reaches the Darling Downs. Photo R. Ashdown. A paper published recently by the Museum of Victoria has assigned scientific names to three species to the genus Tympanocryptis, commonly known as ‘earless dragons’. The paper The Role of Integrative Taxonomy in the Conservation of Cryptic Species: The Taxonomic Status of Endangered Earless Dragons in the Grasslands of Queensland presents the results of taxonomic research from a team headed by Dr Jane Melville from Museum Victoria, and which included Katie Smith and Sumitha Hunjan (Museum Victoria), Luke Shoo (The University of Queensland) and Rod Hobson (Queensland Parks and Wildlife Service). The paper provides clarification of the taxonomy of what has been a confusing genus of reptiles. Some of the earless dragon species still await description, while others may be part of a species group. Naming species is usually never straight-forward. A Condamine Earless Dragon (Tympanocryptis condaminensis). Tympanocryptis means ‘hidden ear’ — the ears of these dragons are covered by scales that make them appear earless. Photo R. Ashdown. The taxonomic status of the earless dragon known from the Darling Downs area has long been uncertain, so the description of this species as Tympanocyptis condaminensis (with the common name Condamine Earless Dragon) has been welcomed by herpetologists, naturalists, and the Darling Downs community that has taken this little reptile to heart. 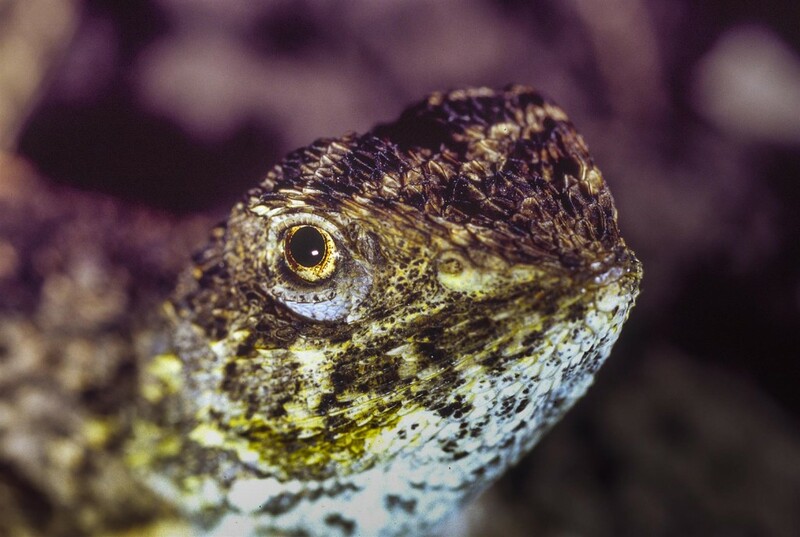 The grassland earless dragons of south-eastern Queensland have long been of conservation concern. 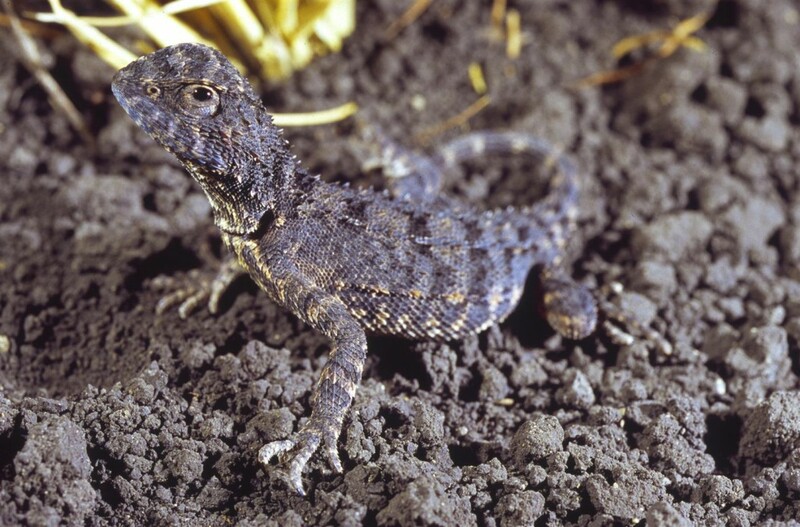 Originally the earless dragons from the Condamine catchment, in the eastern Darling Downs, were identified as Tympanocryptis pinguicolla, after being first discovered in the region over 30 years ago. However, subsequent surveys failed to detect these dragons and they were believed to be locally extinct until their rediscovery in 2001 when a specimen was found in a grass verge along the margin of a fallow paddock. It was found that these earless dragons were restricted to mixed cropping land (maize, cotton, sorghum, sunflower etc. ), remnant native grasslands and grassy verges along roads. Based on these data, the T. pinguicolla populations from the Darling Downs were listed as an endangered species of high priority in Queensland. Since then the taxonomic designation of these populations has been changed to T. cf tetraporophora, based on phylogenetic and morphological data. The paper describes three new species of earless dragon, all found in grassland areas of Queensland, now highly impacted by human activity such as agricultural and pastoral industries, and mining and gas extraction. The Five-lined Earless Dragon (Tympanocrytptis pentalineata). Currently only known from the one location, 50 km south-west of Normanton in the gulf region of far northern Queensland. Named for the dorsal colour pattern of the new species, characterised by five longitudinal white stripes extending along the body. The Roma Earless Dragon (Tympanocryptis wilsoni). Currently known to occur in grasslands, dominated by Mitchell grasses, on sloping terrains in near the town of Roma. Named in recognition of the contributions of Steve Wilson to Australian herpetology, in particular his direct contribution to the understanding of Tympanocryptis diversity in Queensland. Steve Wilson discovered this new species during a survey, provided photographs in-life and collected the only voucher specimens. The Roma Earless Dragon, Tympanocryptis wilsoni. Photographed by Steve Wilson, 40km east of Roma. The Condamine Earless Dragon (Tympanocyptis condaminensis). 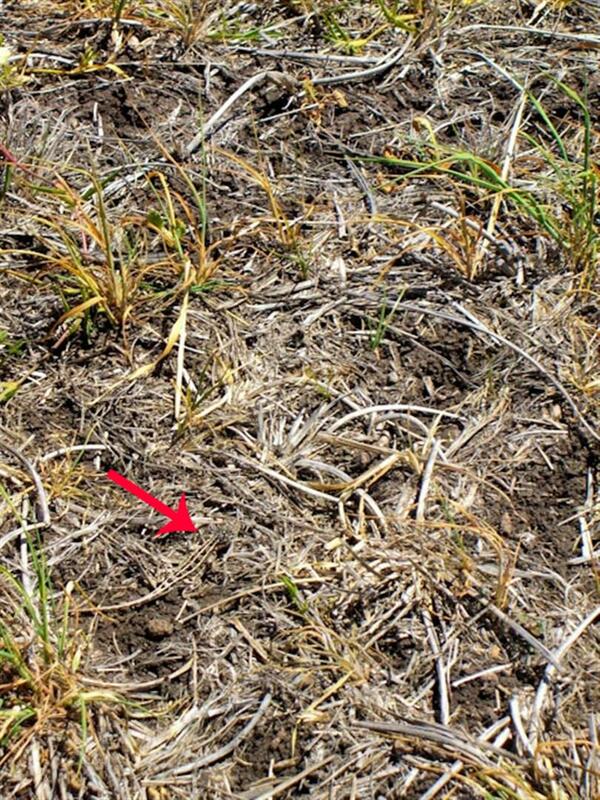 Occurs in the remnant native grasslands, croplands and roadside verges of the eastern Darling Downs, on black cracking clays of the Condamine River floodplain. Found as far north as the Pirrinuan/Jimbour area, west as far as the town of Dalby and south to the township of Clifton. To the east it has been recorded to the eastern extremity of the Darling Downs in the Aubigny/Purrawunda area on the western outskirts of Toowoomba. Specific locations include: Oakey, Mt Tyson, Brookstead, Bongeen, and Bowenville. Named for the Condamine River and its floodplain on which this species occurs. 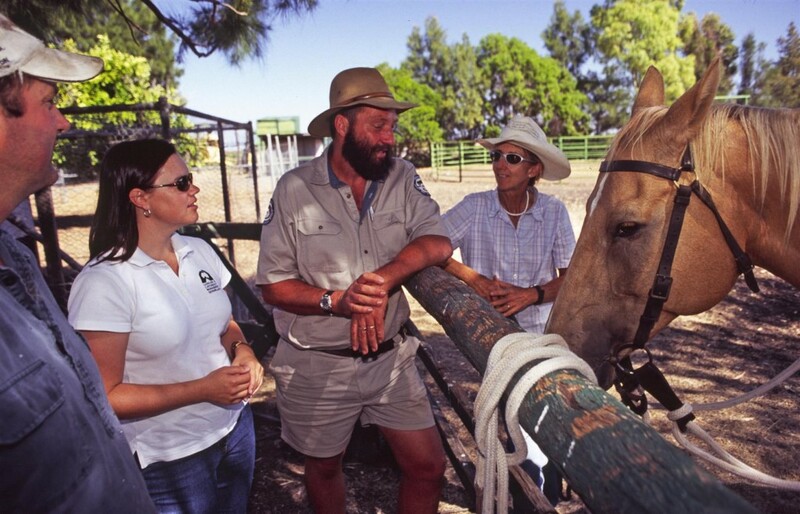 Steve Wilson gets up close to a Condamine Earless Dragon at Kunari, Darling Downs, 2006. Photo by R. Ashdown. Two characters I’m happy to call mates have been heavily involved in this dragon discovery work. Queensland Parks and Wildlife Service colleague Rod Hobson was one of the authors of the paper, while one of the newly-described dragons, the Roma Earless Dragon (Tympanocryptis wilsoni), was named after photographer Steve Wilson. 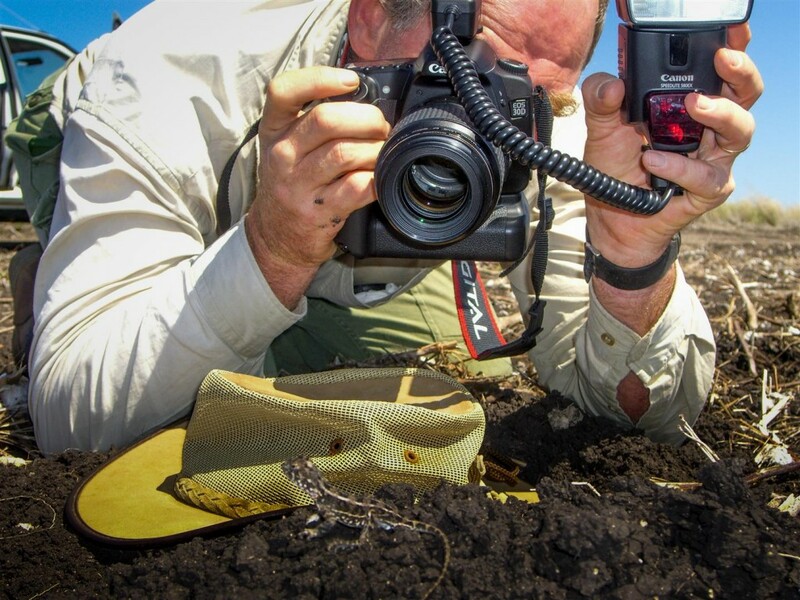 I have accompanied both Steve and Rod on some memorable expeditions looking for, and photographing, the Condamine Earless Dragon in cropland and roadside grasslands to the west of Toowoomba. The Darling Downs community has long campaigned for the conservation of the tiny dragon found in their area. The Pittsworth District Landcare Association and the Mt Tyson District Landcare Group were both instrumental in initiating and resourcing the research which has resulted in this taxonomic work. Local landowners the Wooldridges (Bongeen) and the Halfords (Mt. Tyson) took a keen interest in the future of the dragons found on their properties and in their local area. An adult Condamine Earless Dragon caught on Kunari by Rod Hobson, a Queensland Parks and Wildlife Service (QPWS) ranger. QPWS staff have been involved in research and conservation of the species since its rediscovery. Photo R. Ashdown. So where to now for these newly-named reptiles? The authors believe that the conservation status and management of this group of dragons in Queensland needs to be investigated further. 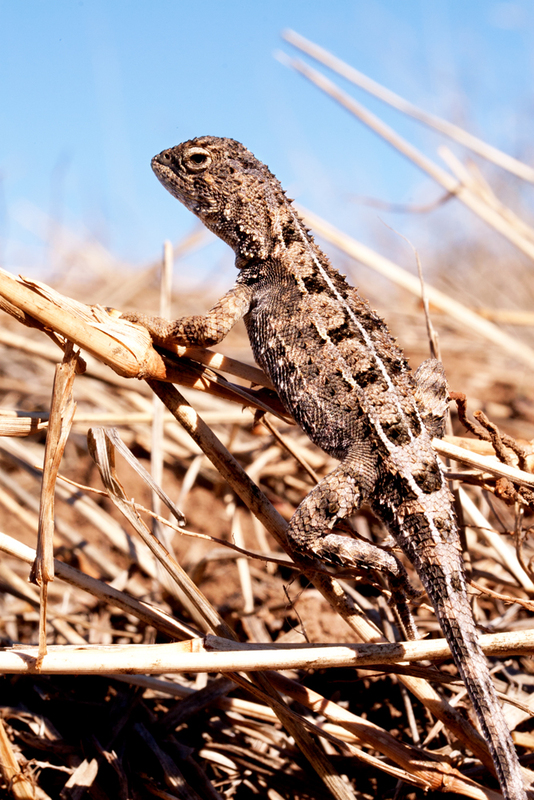 Earless dragons are currently known from only a few sites within the Darling Downs region and are restricted to what were previously native grasslands. The Darling Downs is an important agricultural area on the western slopes of the Great Dividing Range in southern Queensland. 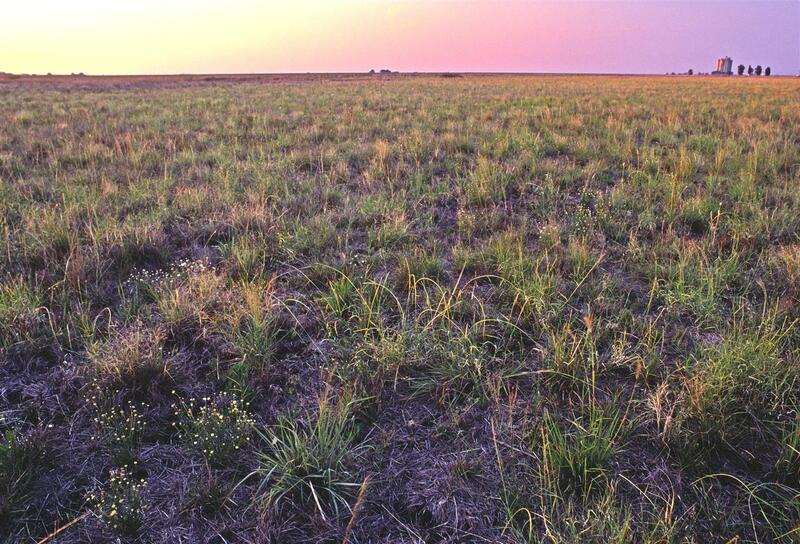 Prior to European settlement, it was an area characterized by open prairie-like grasslands grading into Brigalow (Acacia harpophylla) and Belah (Casuarina cristata) on cracking clay soils. These fertile soils have been heavily modified since European settlement and very little native grassland remains, making this one of the most threatened ecosystems in Queensland. “The grasslands around the Darling Downs are subject to both mining (coal seam gas exploration) and land clearing encroachments. That loss of habitat is pushing the dragons into smaller and smaller areas — we found some along roadside verges, trapped on that very narrow strip of land,” says Jane Melville, Senior Curator of Terrestrial Vertebrates at Museum Victoria, and lead author of the paper. 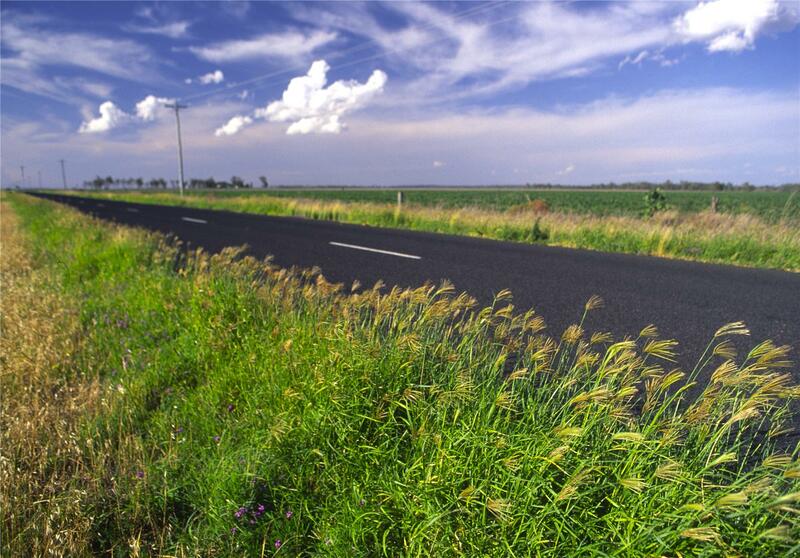 Roadside verges have become critical habitat for Condamine Earless Dragons. Photo R. Ashdown. Melville believes the discovery of an additional species on the Darling Downs highlights how little is known about fauna in these grasslands and the fundamental need for further ecological and genetic research on both species. An article written by Rod Hobson for the Winter 2006 edition of the Queensland Parks and Wildlife Service publication The Bush Telegraph gives an overview of the history of the Condamine Earless Dragon. 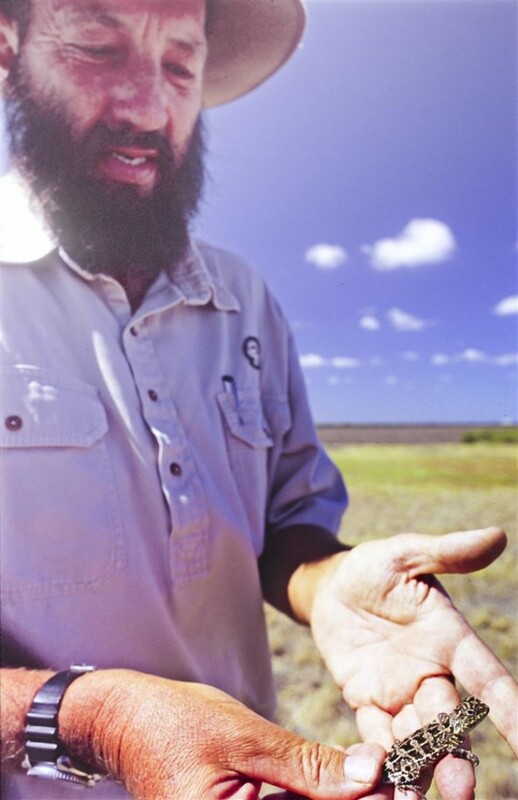 In the early 1970s amateur herpetologist Terry Adams found two little lizards in the black soil country at Mount Tyson on the eastern Darling Downs. These lizards caused a few raised eyebrows when they eventually came to the notice of staff from the Queensland Museum. Here was a new species for Queensland — a lizard that until then was only known from small and isolated populations confined to native grasslands west of Melbourne, the ACT and adjoining areas of New South Wales. It was the grassland earless dragon Tympanocryptis pinguicolla, regarded as one of Australia’s most rare and threatened of species. Repeated searches after Terry’s initial discovery however failed to reveal any more individuals of this little dragon lizard. It was feared to be extinct in Queensland. 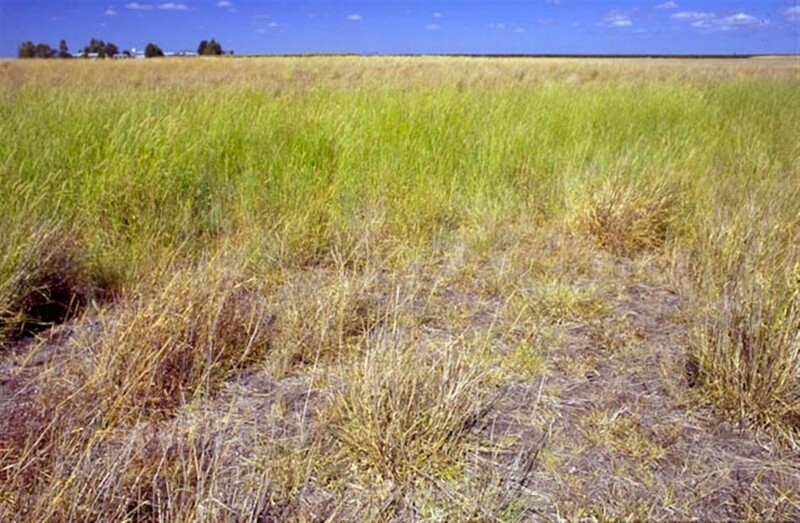 Grassland on Bongeen, Darling Downs, 2005. Typical dragon habitat. Photo by R. Ashdown. 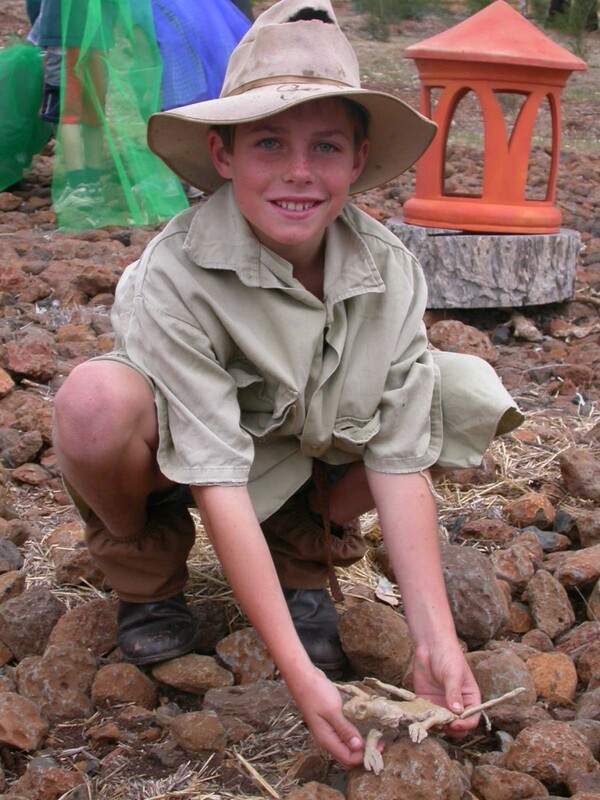 Then, in January 2001, students from the University of Queensland’s Gatton campus caught a small lizard whilst working on a project on the property of Dennis and Rose Wooldridge, at Bongeen on the eastern Darling Downs. The students’ supervisor Dr. Luke Leung forwarded the lizard to the Queensland Museum for identification. Its arrival there caused a furore — here was the lizard thought to have become extinct in Queensland since its initial discovery in the early 1970s. 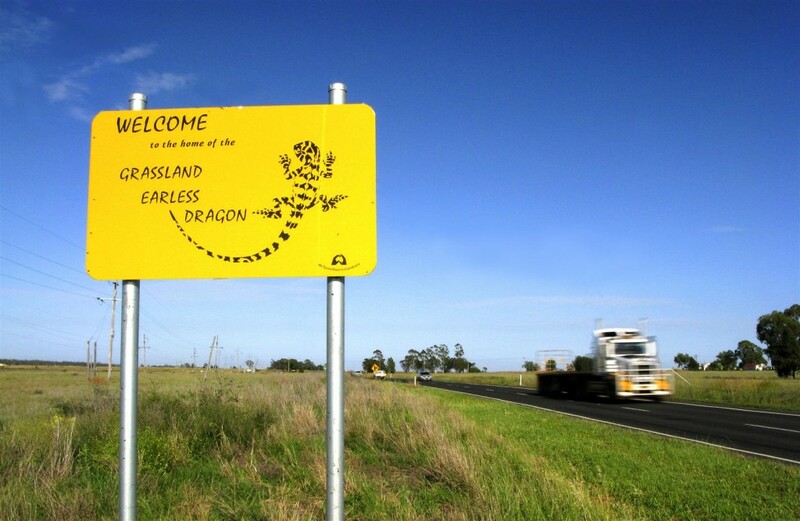 It was at this early stage that Queensland Parks and Wildlife’s Toowoomba office became heavily engaged in the Grassland Earless Dragon Project, a commitment that continues to this day. 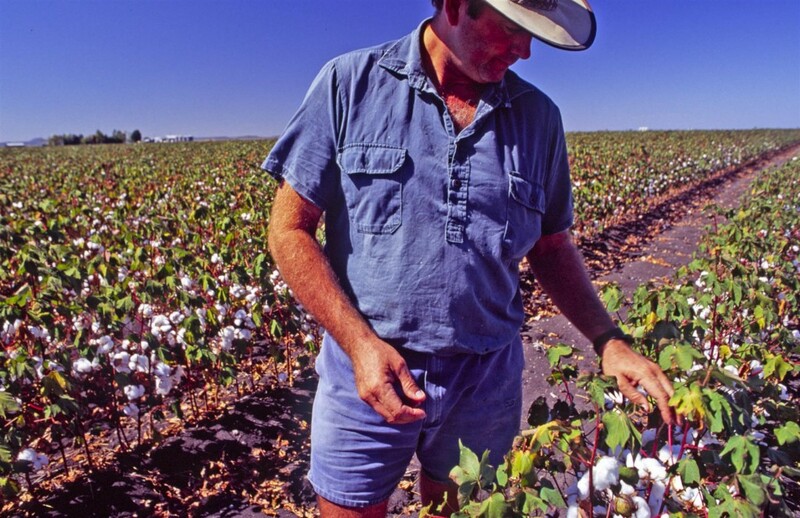 Dennis Wooldridge stands in a crop of cotton on his property Kunari at Bongeen on the Darling Downs. The Condamine Earless Dragon is quite at home in a mixed cropping regime of cotton, sorghum, sunflower and maize. The dragon also requires adjoining remnant grasslands for breeding and as a retreat during harvesting operations. Photo R. Ashdown. Discussing the dragon at Kunari. (L to R) Dennis Wooldridge, Alison Goodland, Rod Hobson and Rose Wooldridge. Kunari was the original site of the dragon’s rediscovery. Dennis and Rose have continued to be enthusiastic and committed participants in the grassland earless dragon project. 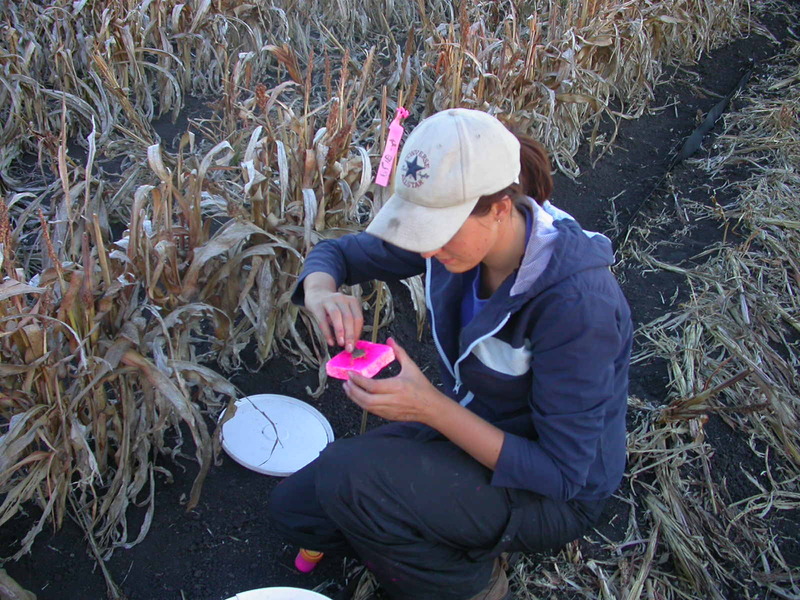 Alison at the time worked for the Queensland Murray-Darling Committee and was instrumental in the grassland earless dragon project since its inception. Photo R. Ashdown. Since those heady days quite a few organisations, both government and non-government, have become involved with this great little lizard. Steve Wilson, Patrick Couper and Andrew Amey from the Queensland Museum have been ready and willing to provide technical and scientific information as needs arose. Students and staff from the University of Queensland’s Gatton campus have been busy on research projects, especially on the genetics of the species. Tom Halford releases a clay dragon into the ‘biodiversity area’ at Mount Tyson State School during the ‘Kids and Dragons’ project. Coordinated by the Mount Tyson District Landcare Group and funded by a community awareness grant from The Department of Natural Resources, Mines and Energy, the project raised dragon awareness in the local community. Tom’s parents, Paula and Peter Halford of Nyleta at Mount Tyson, have been enthusiastic in coordinating dragon conservation efforts on the Darling Downs since they discovered dragons on their property several years ago. Photo Alison Goodland. Carly Starr, a student from University of Queensland (Gatton Campus) applies fluorescent powder to track an earless dragon during her Masters project on the species. This picture was taken in sorghum stubble on Nyleta, a property owned by dragon enthusiasts Paula and Peter Halford at Mount Tyson on the Darling Downs. No animals were harmed during the study. Photo Josh Bassett. Perfectly camouflaged! It’s hard to spot one of these tiny dragons . Photo R. Ashdown. 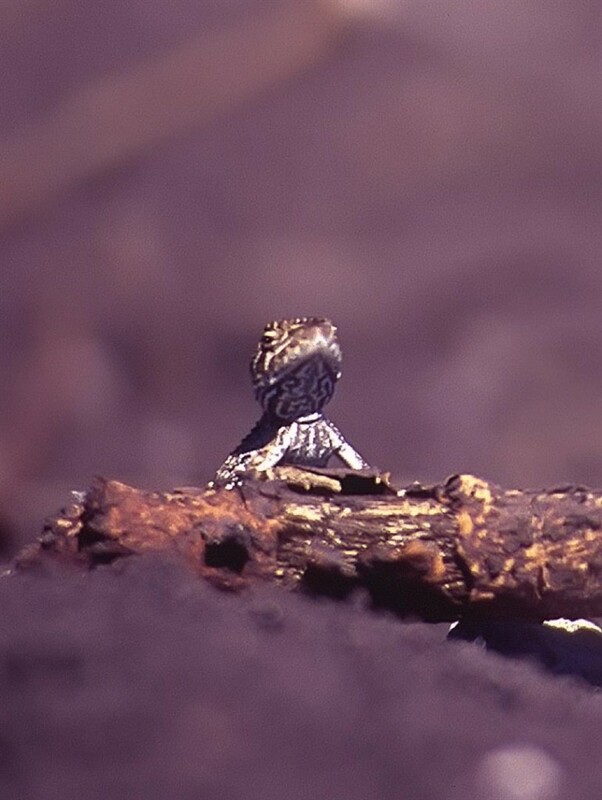 Condamine Earless Dragons can at times be seen perched on grass as they survey their surroundings. Photo R. Ashdown. Students Leigh Jewell, Violeta Toneva, Carly Starr and Stephanie Goebel under the tutelage of Drs. Greg Baxter and Luke Leung have contributed significantly to our understanding of the species through their tireless fieldwork. Alison Goodland, initially through her work for World Wildlife Fund, and lately with the Queensland Murray-Darling Committee/Condamine Alliance, has been in ‘boots and all’ since the early days of the project. The Mount Tyson Landcare Group has contributed generously towards the project with their time and enthusiasm, especially through local landowners Paula and Peter Halford. 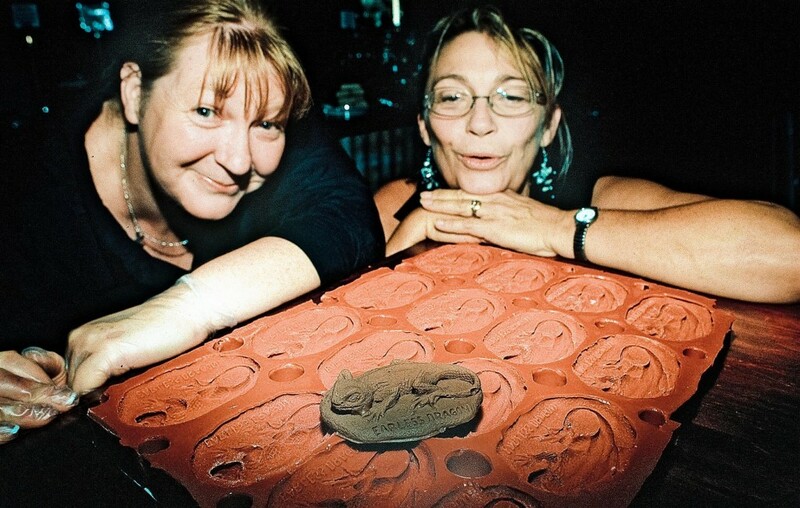 Heather Hanlon (proprietor of speciality chocolate shop and restaurant White Mischief) and Paula Halford (Mount Tyson District Landcare) inspect a newly hatched chocolate earless dragon. Carefully hand-crafted by Heather, these novelty lizards have sold well, with funds raised going directly to dragon conservation. Photo R. Ashdown. Heather Hanlon of White Mischief chocolate shop and restaurant at Mount Tyson has been industriously turning out chocolate earless dragons — with all funds going towards earless dragon research and conservation initiatives.Shona Clark-Dickson and her pupils from Inglewood State School raised just under $200 for the dragon through sales of chocolates and greeting cards at their school fete — well done to Shona and the kids. 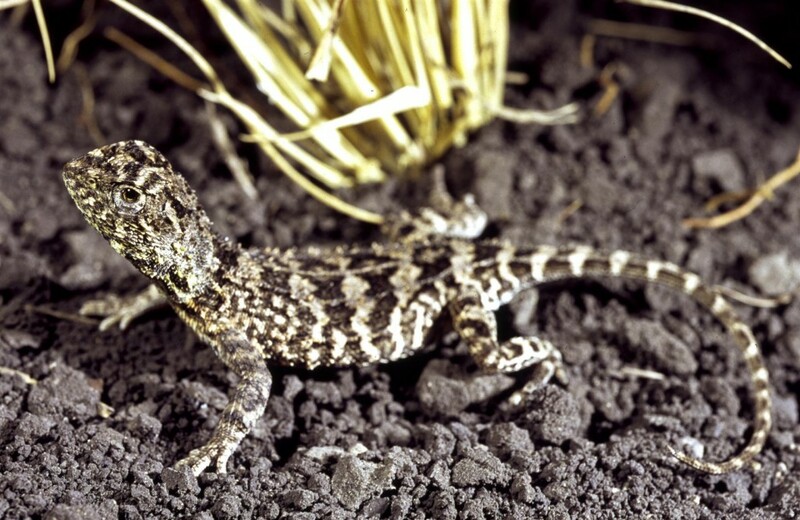 Throughout the entirety of the project Queensland Parks and Wildlife Service (QPWS) staff from the Toowoomba office have been involved in giving school talks, media interviews and writing articles on this great little Aussie battler of a lizard, which chooses to make its home amongst the sorghum, cotton and sunflower crops of the eastern Darling Downs. Small, but full of character. A Condamine Earless Dragon photographed at Kunari. Photo R. Ashdown. 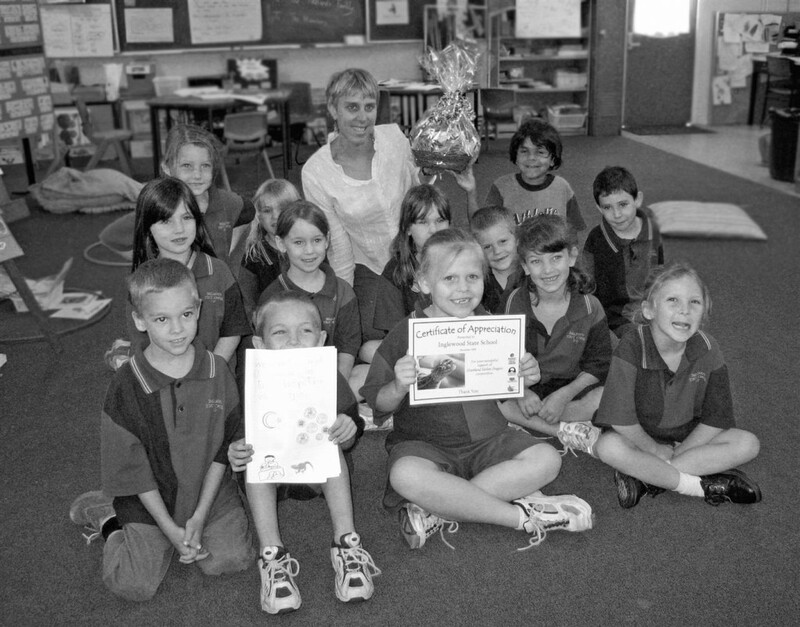 Pupils of Inglewood State School with their teacher Shona Clark-Dickson. The class raised $200 for dragon conservation by selling greeting cards and dragon chocolates at their school fete. Photo R. Ashdown. To date we have records from as far north as Jimbour, west to Cecil Plains, south to Nobby/Clifton and east to Mount Tyson and all thanks to the local landowners who have generously allowed us access to their lands. We couldn’t have had the successes that we’ve had to date without your unstinting enthusiasm and kindness. This happy marriage of such a diversity of groups couldn’t have succeeded to the extent that it has without you. So thanks to everyone involved and may the marriage be a long and happy one. Here there be dragons! On the main east-west highway through the Darling Downs. Photo R. Ashdown. Kunari, Darling Downs, 2006. Photo R. Ashdown. 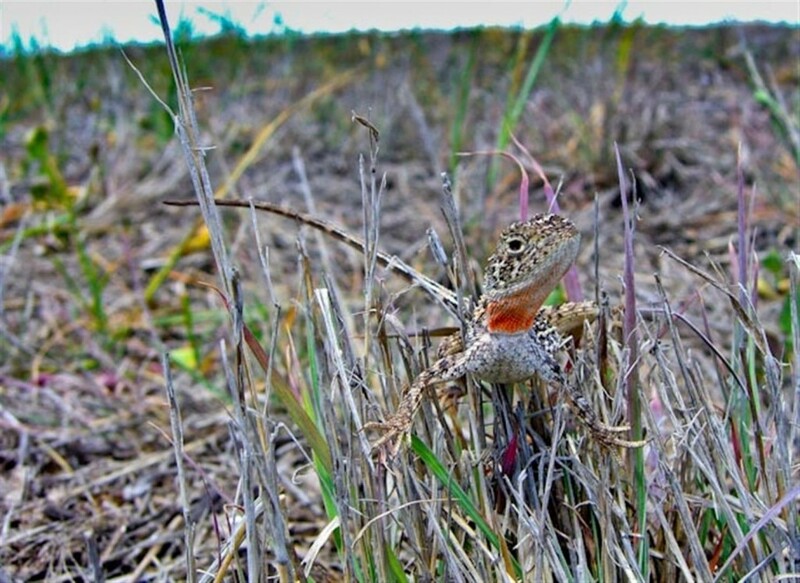 The Role of Integrative Taxonomy in the Conservation of Cryptic Species: The Taxonomic Status of Endangered Earless Dragons in the Grasslands of Queensland. It is about time too, great piece Robert. A beautifully presented insight into a beautiful little dragon. I’m glad that there are folk who discovered it and now study them. I’m also grateful for the new generations willing to preserve them. Top read for Christmas Day. Thanks, Rob. Thanks Russ, much appreciated. I hope this finds you well mate. Cheers. Fabulous informative post about this special little dragon – I do hope to get the opportunity to see one, one day. Merry Christmas. Thanks Judi. All the best, Rob.